New Campaign for Clients of Fitness Clinic for Individuals with Disabilities! 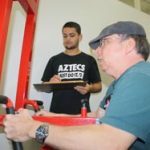 Tom Colligan (r) works out with assistance from SDSU Kinesiology Major Anthony Lima. The SDSU Alumni Association has initiated a comprehensive campaign to raise funds to assist clients of the Fitness Clinic for Individuals with Disabilities with payment of their participation fees. Approximately 40% of the clients served by the Clinic are unable to pay the full amount of their participation fees and this campaign will supplement the fee payments of those individuals. Moreover, the campaign will allow additional clients who are unable to pay the Clinic fees to join the Clinic to get their fitness needs. You can read more about this campaign on the Alumni Association web site.